Consistent branding is not only critical to the customers you serve, but also to the talent you want to hire. Here are 5 benefits of adding a Culinary Agents' Career Page to your website. Make the right first impression to recruit the best candidates! Your Culinary Agents' Career Page displays the active jobs that you have posted on CulinaryAgents.com in real-time, allowing you to promote opportunities to join your team to your site visitors. The Implementation requires minimal effort - no IT department required! Your Culinary Agents' Career Page makes it easier for candidates to apply. Members of the Culinary Agents professional network can apply with one-click. Then you can easily manage them via your Culinary Agents Business dashboard. All are welcome to join the Culinary Agents network. It is free and members can sign up with their existing accounts (e.g., Facebook, Google, LinkedIn). Adding a Career Page to your site is FREE - there are no fees or additional costs to add a Career Page to your site. This feature is included when you post jobs on CulinaryAgents.com. 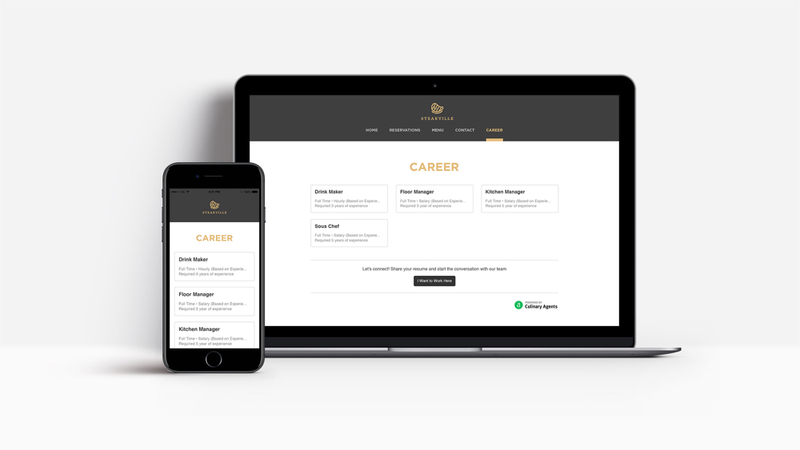 After adding your Career Page to your site, we do the heavy lifting for you - distributing your jobs to major job aggregator sites and to the proprietary network of Culinary Agents. Simply copy-and-paste the code (link to 3rd step bookmark) onto your webpage. Please refer to our developer guide for further instructions or send to your website developer. Setup a Culinary Agents business account and get started today!